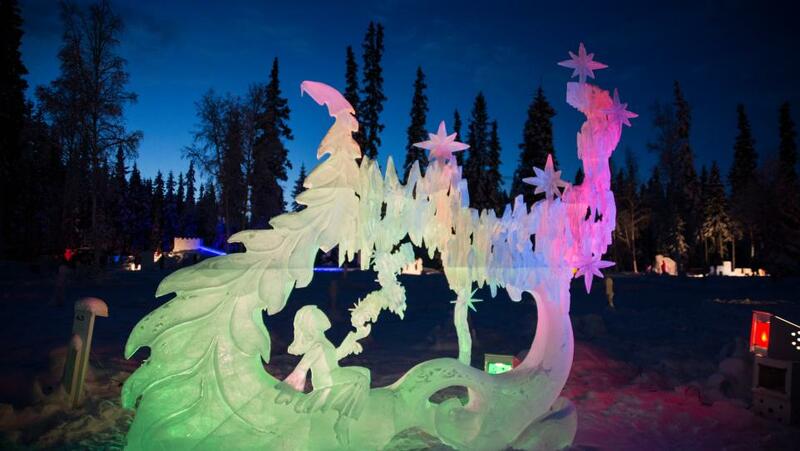 Christmas in Ice is an annual event that lights up the Christmas season in North Pole, Alaska. The Ice Park features a Christmas-themed ice art competition during the month of December with sculptures by local and international carvers. There is a youth ice carving competition in addition to single block and multi-block competitions. Special events include a Community Picnic Under the Stars and Military Appreciation Day. Santa will be there on Christmas Day and on New Year’s Eve, you can enjoy hot cocoa and fireworks at their special family-friendly event. There&apos;s always something new to see and do at Christmas in Ice. In year&apos;s past, a skating rink was created surrounded by castle walls built with the help of the 70th Brigade Engineer Battalion from Fort Wainwright. For the young, and the young at heart, there&apos;s always Elf’s Icy Playground with 100-foot ice slides, mazes and twirlers. Visitors are encouraged to stay and have as much fun as possible on the ice. And if you get cold, concessions and gifts are available in a warm, cozy indoor reception area. You might even see Santa and Mrs. Claus! Christmas in Ice is a family-friendly event made possible due to the generous help of many community volunteers. Get into the holiday spirit and let Christmas in Ice light up your holiday! More Information: call (907) 590-2522, or you can find information, videos and event pictures at www.christmasinice.org. Ready to plan your winter adventure? Click here to get a winter travel guide delivered straight to your door. See you soon! Official Visitors Bureau of Fairbanks, Alaska, where you can experience northern lights that change you, a summer midnight sun that charms you, the vast Arctic wilderness on our doorstep and a magnificent neighbor, Denali National Park.